Keep your pool clear of algae and muck with the Aquabot Abreez2. This robotic inground pool cleaner prowls the bottom of a pool to brush up any dirt or debris. Free up some time for yourself as the two top-mounted filter baskets collect the dirt it scrapes off. You just need to bring the robot up from the pool's base for emptying. Purchased this AquaBot Breeze XLS to replace an older-model AquaBot that failed on me after 3 seasons, servicing my 16' x 36' in-ground. I liked the newer features compared to my old one - the bottom scrubbers meant brushing the pool floor less often; the 2 filter modules were easier to remove and dump/clean than my old one's loose nylon filter bags; the wheel rotation's easier to adjust with selector switch; and, the swivel cord is longer and less tangling. Worked pretty well. However two issues: first, the covers that secure the filter modules are flimsy and don't always lock properly; and, the optional fine filter bags that fit into the filter modules don't secure snugly enough and allow leaves to jam the jet doors, which stops the cleaner in it's tracks - in fact it's an optional "bonus" item although none of the paperwork stated that, which I learned the hard way and that they are practically useless, so stay away from those fine filter bags. Otherwise, a decent unit for the price. Oh and I found the power unit died with my old cleaner, and AquaBot sent me a replacement (barely within the 2-year warranty) - so now I have a back-up! Not as good as it should be. No matter how much I adjust the wheels it does not seem to ever clean the whole pool. I have a 15x30 above ground pool that I thought this would do a great job on, based on the reviews I read. Maybe it's because my pool is oval and not a rectangle? Also it gets stuck in the corner where the stairs are. I think that might be because, being an oval pool, there's not much room for it to maneuver before it hits the curve of the pool wall. It has no trouble picking up big debris but seems to leave behind the really fine stuff. The bottom of my pool is not perfectly smooth, as is the case with most above ground pools, and if there is any fine debris in one of the very small spots that are irregular, unlevel, or wrinkled, it goes right over it and the dirt is still there. So if your pool floor isn't perfectly smooth, expect to have a few spot like this. They call this a "robotic" pool cleaner but I'm not sure where the robot intelligence is. It doesn't map the bottom of the pool, so it's not like it knows where it's at. From what I can tell, it has a turbine propulsion system that moves it back and forth, and an adjustable offset wheel axel that makes it turn slightly with each back and forth cycle. This makes it no more intelligent than the Aquabug which is totally gear-driven. On a positive note, it appears to be well-made and is super easy to operate. I can't say it's a good value because it doesn't do the job it's supposed to in my pool. Good Unit for the $$$. Great Unit for the $$$. Likes to stay near the deep end of my pool put is a nice alternative to the old traditional vacuuming of the pool. This is my first unit of this type so I can t compare this to any other unit. I followed the instructions and was pretty much plug in and go. Have used it 3 times since I have gotten it and does a better job than me manually vacuuming. Would recommend to others. I purchased this based on reviews I read and the brand name. It is supposed to climb a little ways up the pool walls, doesn't. It does not clean entire pool and will barely climb out of the deep end of my pool. When it does, it gets stuck at the edge of the slope to the deep end. It does vacuum well but that spot was clean a half hour ago. The brushes are a joke. This isn't an expensive cleaner but there are other cleaners $50 to $100 less that work just as good. I waited a month to write this review to give an honest assessment. Shipping was fast and packaged well. I like the unit (Aquabot Breeze XLS). I just can't seem to see the cost justification in ANY of pool cleaner. 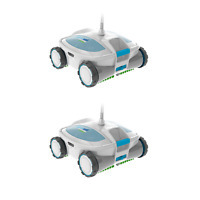 They are a plastic motorized mini vacuum cleaner. However I think they would sell more to regular folk if they lowered the price. (Just my opinion). However, because I'm disabled and the pool is my daily physical therapy, but cleaning the pool would be more than I could do on a daily basis, I needed one. I run this unit without the filter bags most of the time (once a day). About once a week I put the filter bags in to pick up the fine debris and dirt. It does a great job. My pool is next to a row of trees so I have more liter than other people may have. This unit covers the floor of the pool without missing one end like my last (slightly) cheaper Aquabot unit. The longer swivel cord is a plus and being able to change the wheel direction easily from the front of the unit is easy. If you don't use the bags, then while you are removing the unit from the pool it will sometimes backwash a little bit of the debris back into the pool. But cleaning the fine screen compartments is much easier than cleaning the filter bags. I'd recommend this unit.